The first ever West Austin Studio Tour is happening this weekend! WEST is a free, self-guided tour that champions the abundance of talent of Austin’s large and wildly diverse creative community. The public is invited to discover new artistic talent, see working studios, learn about artists' tools, techniques, and inspirations, and support the arts community by building their collections and supporting local businesses. 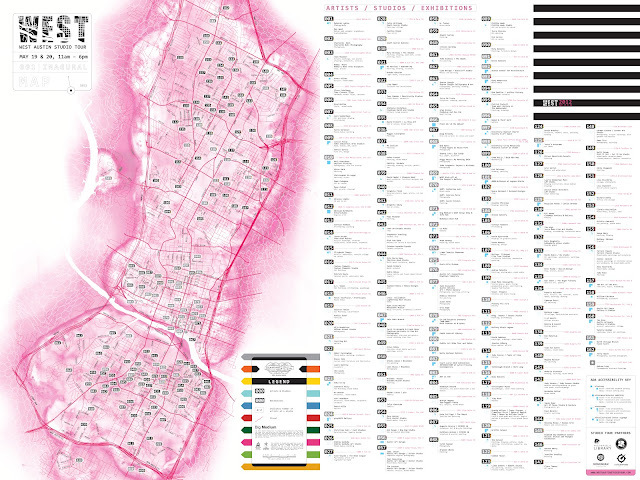 WEST covers a wide geographical area; just as non-homogenous as Austin itself, the broad range of work reflects the eclectic abundance of artists working west of I35. Additionally, a number of pop-up spaces are presenting art shows and events. The tour is this Saturday and Sunday, 11am – 6pm and open to everyone! Check out the WEST catalog for details on tour participants. HBA Tour of Homes THIS Weekend! 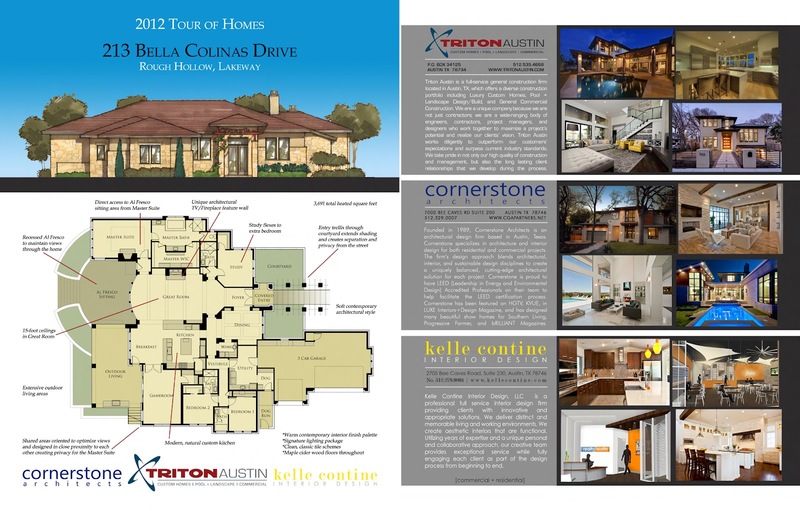 Join us today through Sunday for the 2012 Tour of Homes! Get your all access pass for only $5 at the Rough Hollow Welcome Center during the 3 day event. Visit 10 different communities and 75 beautiful homes in 3 days! 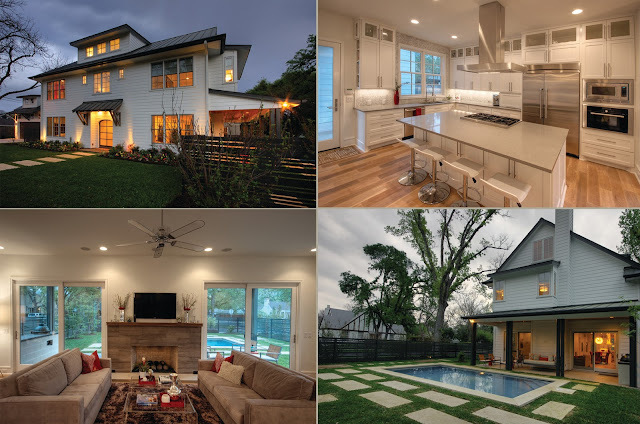 We are very excited to announce that we have been selected to participate in the 26th Annual AIA Austin Homes Tour! The tour will be held October 6th and 7th, and highlights projects from 14 local architects. For more information, visit AIA Austin. The Westover lot presented a unique challenge in balancing the owner’s program within McMansion ordinances. The program called for an open entertaining area on the main level that, while engaging with the site and neighborhood, also needed to maintain privacy from pedestrian traffic on this corner site. The living spaces are organized on the northeast side opening up to a loggia, garden and pool area. The entry, circulation, and dining areas disengage the prep area and study while maintaining a visual openness to the plan. Ordinances play a pivotal role in the massing leading to vertical and horizontal breaks, and in detaching the garage from the main body. The historic distinctiveness of Pemberton Heights is critical in the material selection, colors and details. Fenestration is carefully orchestrated to let ample light while playing an important role in the design language. Cost, simplicity and the neighborhood vernacular were driving factors in the design approach. Built by Butterfield Custom Homes. Interior design by Amy Lutz. Conceived as a remodel and addition, the final design iteration for this home is uniquely multifaceted. Structural considerations required a more extensive tear down, however the clients wanted the entire remodel design kept intact, essentially recreating much of the existing home. The overall floor plan design centers on maximizing the views, while extensive glazing is carefully placed to frame and enhance them. The residence opens up to the outdoor living and views from multiple spaces and visually connects interior spaces in the inner court. Glynis, of Glynis Wood Interiors, had a vision of ‘transitional’ style for the home, marrying clean and contemporary elements with touches of antique charm. Energy efficient materials along with reclaimed architectural wood details were seamlessly integrated, adding sustainable design elements to this transitional design. The architect and interiors collaboration strived to achieve modern, clean spaces playfully interjecting rustic elements throughout the home. Built by Greenbelt Homes. Photography by Bryant Hill.